In the early 1980’s I was cooking on the line in a small restaurant in New York City. One of my first jobs out of cooking school, I was learning to set up my station quickly and absorb the finer points of putting out food consistently throughout dinner service. It was a tiny kitchen. The only other cook was my boss. He was a great mentor- taught me a lot and encouraged me to always challenge myself. If I didn’t know how to do something he would put it on my to-do list the next day. Before service one night at work I got a phone call from my boyfriend (now my husband). At the last minute he had been invited to go to Lutèce, Andre Soltner’s acclaimed restaurant for dinner and wondered if I could go with him. My boss overheard me say “I can’t go to Lutèce tonight, I have to work.” He interrupted and said “Of course you can go. You’ll learn more at Lutèce eating dinner than you will cooking here tonight.” I rushed home, changed my clothes and an hour later I was sitting in the plush dining room on East 50th Street. A dream come true for any cook- young or old. From 1961 until he sold it in 1994, Andre Soltner and his wife, Simone, were Lutèce. They visited every table providing a warm atmosphere that was unusual for a formal French restaurant at the time. In the three decades they owned the restaurant they only missed about 5 services. It had a four star rating and was recognized as one of the best, if not the best, restaurants in The United States. 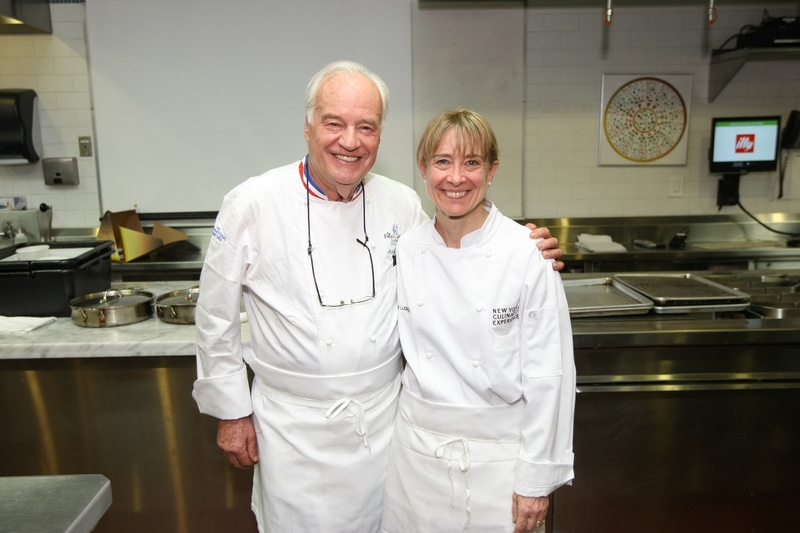 He served classic French food with many dishes from his native Alsace. Fast forward 30 years and this past Saturday night I got the chance to cook a dinner with Andre Soltner. If you had told me when I was first starting out I would have the opportunity to spend an evening in the kitchen cooking with him I would have shook my head in disbelief. The occasion was the New York Culinary Experience sponsored by New York Magazine and The International Culinary Center. Chef Soltner’s dish was veal cheeks with spatzle. The base of the sauce was a text book perfect beautiful veal stock he had made. The flavor was rich but not too gelatinous and gummy as many veal stocks can be. The color was a gorgeous deep dark mahogany. The veal cheeks melted in your mouth. The other chefs preparing courses were New York Chefs. Wylie Durfsne from WD-50 prepared slow cooked trout with a light delicious potato puree and Michael Tropeano from Silhouette served sautéed foie gras with pineapple several ways. The acidity of the pineapple produced the perfect balance to the rich foie gras. For dessert, since I was cooking with Chef Soltner a French chef of the old school, I chose something classic. I made Rhubarb Apple Charlottes and served them with Caramel Crème Fraîche. And to my delight he loved them. Working side by side with Chef Soltner will be one of my culinary highlights just as eating in his restaurant was so long ago. arts n’ jest edibles llc.